A few weeks ago Olympia’s majestic, 650-seat Capitol Theater once again featured its burlesque main squeeze- TUSH!- in a one-off themed show paying tribute to a subject wide open to interpretation: art. TUSH! Mounts the Masters featured ten inventive acts, a musical guest (Autry, from Portland), and two special guests, Paris Original and Olympia’s Wednesday du Monde. Arriving at the historic downtown theater not long before show time, it was apparent that when TUSH! performs in Olympia, it is a very big deal. The line wound through the theater’s lobby and down the block, and the crowd was charged with anticipation and good spirits. Similar to the wide net cast by larger scale productions in Seattle, it seemed that the audience was not so singularly burlesque-focused, but more of a cross section of general fans. Patrons and spectators seemed curious not only about striptease revivals and (mostly) naked ladies, but in live performance and “fringe arts” in general. In other words, Olympia really loves its arts community, and TUSH! reigns supreme in the realm of the tease. Sharp-witted host Hattie Hotpants expertly guided the enthusiastically vocal/somewhat rowdy audience through an array of well-known artists and famous works cleverly reinvented by TUSH! The stupendously beautiful Nani Poonani paid tribute to Georgia O’Keefe in a visually stunning cape and high-drama reveals, Frida Fondle played a deadpan Frida Kahlo, and Princess Lucky Buttons gave the Mona Lisa a raunchy run for her money. Paris Original started out as a chaste Degas ballerina, but moved by classic song “The Stripper”, quickly shed his skirts as well as his inhibitions. Bettie Beelzebub launched a hilariously over-the-top interpretive go-go dance tribute to Surrealist Salvador Dali complete with eyeballs and lobsters (and a hand from assistants Nani Poonani and Hattie Hotpants). The final number was a pastoral scene of nymphets and voluptuous ladies in repose, quickly coming to life to the exquisite pleasure of an unsuspecting museum guard. TUSH! Mounts the Masters was polished and professional, but gritty enough to keep minds just a little in the gutter- as it should be. It’s easy to see why the ladies have developed such a dedicated following and undomesticated reputation in their hometown of Olympia. They’ve got a wicked sense of humor, talent, and ideas to match. Burlesque Seattle Press: How did TUSH! form, and how long have you been together? Bettie Beelzebub: TUSH! was originally formed in 2009 with a friend who has since moved – it started originally with the name TUSH! and a Craigslist ad! Nani Poonani was one of those originals, and me. We heard that a local business wanted to do burlesque as a “First Friday” type event. So I went there to inquire about it, and met Frida Fondle (she just happened to be that store’s manager), who said “OH! I just took Indigo Blue’s Burlesque 101! Let’s DO THIS!” The troupe just kind of fell together naturally after that- we have members from Burlesque 101 and we have members with other backgrounds in dance, theater and other performance. We recently lost two members – Black Bonni- who needed to devote more time to school- and Bad Astrid- our former stage manager who is moving soon to Seattle. How often do you perform together? TUSH! does 3 or 4 of our bigger “themed” productions a year. We rehearse and plan for each of those shows for a couple of months leading up to them. The sisterhood that we have formed in this troupe- I’d like to say that for us, the time we spend together getting ready for our shows really adds to the quality of our shows. This troupe is a family. Many of our members also perform in other shows throughout the year. The Capitol Theater is fantastic- it must be a great stage to perform on. Is that pretty much your home base? How did that relationship develop? Yes! The Capitol Theater has become a home for us! We love performing there – we wouldn’t have it any other way! It has a long vaudeville history (and even a few ghosts!). We started at the Capitol Theater with the Dangerous Curves/Burlesque on the Go Go tour with those lovely NY ladies- and our relationship with the theater developed from there. YES! Olympia LOVES its performance, of all kinds- theater, music, art…we have a wonderful, diverse performance community. It’s a social thing with Olympians- it’s a big part of our “downtown culture”. It’s a big part of this town. 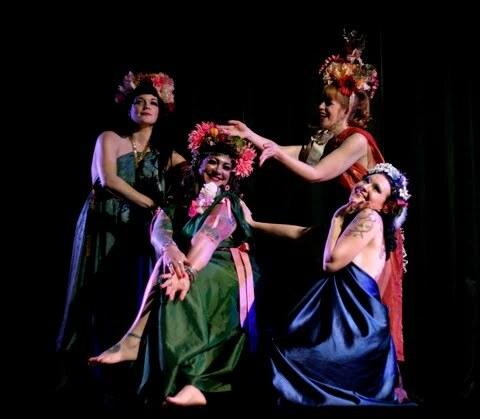 From live music to our twice yearly Arts Walk to our own Procession of the Species, Tallhouse Arts Consortium, Theater Arts Olympia and The Midnite Sun Performance Space and its yearly Vaudeville Show- we have it all here! Performance as a form of creative expression thrives here because of the wonderful support it receives from the community- it’s a circular thing. What would TUSH! be without Hattie Hotpants?? She is the glue that holds us together on stage. She is a BIG part of this troupe, our face to the world. Hattie is an amazing MC because she not only has a wonderful sense of humor, but her improv skills are pretty unmatchable. She has an extensive performance / theater background. We are very lucky to have her. Were most of these acts, including the group number, created especially for this show? YES! Members of TUSH! take a lot of pride in how hard we work to develop new acts to fit our themed shows. TUSH! shows are thought of a lot like plays I think- we work to tell a story with our shows- with a cohesive running gag throughout- with the Art show it was our security guard Prince Snappypants. Who are the other troupes out there in Olympia? Rock Candy was mentioned by Hattie…and they’re doing a Madonna tribute March 30? We are excited to support the newest troupe in our South Sound burlesque community, Rock Candy- and we look forward to their debut. I know they are working very hard to produce a fun show. I’ll be doing pick-up for them for that show. How was the idea for this show conceived? TUSH! decides on show themes by literally making a list as a group, narrowing that list down to a reasonable few fun ideas, and then pulling one “out of a hat”! ART was one of those themes decided on that way. Once the group has made the final decision on the theme, each member proposes to the group what they would like to do under that theme- then we give each other continued constructive feedback through weekly rehearsals until all of our pieces are fully developed. I feel that once our themes are decided upon, the excitement tends to build- we are all very supportive of each other’s ideas and love watching them develop. ~ by angrytruffle on 02/21/2012. We LOVE TUSH! We always have fun helping the ladies on and off the stage and we always hang with anticipation for their next ventures! And thank you so much for the shout-out to Rock Candy Burlesque!! !